For over 30 years, the board game Dune has often been talked about in hushed awe by a generation of gamers who have heard countless tales of its groundbreaking game play and legendary subject matter. For many, there was no way to prove nor disprove the rumors in these tales, as the game was often harder to find than the legendary cup sought after in the Crusades. Not long ago, Fantasy Flight Games announced that they would rerelease the classic game, but reimagined for the Twilight Imperium universe. Those that had not yet played Dune rejoiced, and those that had played Dune often recoiled in terror at the thought of any semblance of change. Those fearing change needn’t have worried – if there’s one old saying that seems to hold true in the world of boardgaming: The more things change, the more they stay the same. Hey, it's Fantasy Flight - it's always bigger on the inside. Yes, dear readers, Rex: Final Days of an Empire is, essentially, Dune. Yes, the graphics have changed; yes, the storyline is different and some of the mechanics have been tweaked; yes, the epic, bloody battles take place in a sprawling city rather than across the arid, dangerous dunes of Arrakis – but for all intents and purposes, Rex is Dune. However, unlike Dune, Rex is actually fairly interesting and doesn’t take six hours to play – usually. Although I could continue to break down how Rex has evolved from its predecessor, for the purposes of this review I will, for the most part, simply break down how Rex plays, what it’s all about, and whether it’s worth your time and money. After all, there are probably more of you out there who have not played Dune than those select few who have. The core story behind Rex is that the key races from the Twilight Imperium universe – The Emirates of Hacan, The Universities of Jol-Nar, The Barony of Letnev, the Xxcha Kingdom, the Federation of Sol, and the ancient Lazax Empire – are all vying for control of Mecatol City, the capital burg on the planet Mecatol Rex, which is the center of shopping, gaming, politicking and just about everything good in the Twilight Imperium universe. Don’t worry too much about the plot as there are seven pages devoted to some serious fluff in the rulebook for interested parties. Just know for now that every race is grumpy with every other race, and they’re all heavily armed with itchy trigger fingers. Or whatever appendage looks most like a finger. 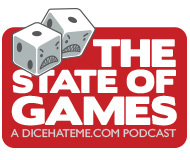 The key resource in the game – other than troops with which to fling at foes – is Influence. Influence essentially acts as currency in Rex, and players can use it to buy Strategy Cards, troop reinforcements or to sweeten the pot during negotiations with other players. Players may gain Influence each round from the base Influence stat on their race sheets, or through maneuvering troops into often-hostile situations to take it by force. The game is broken down into eight rounds, with each round further broken down in to seven phases. The first phase is gaining spice, I mean Influence. The top card of the Influence deck is revealed and an event occurs that typically involves placement of Influence in one or more places around the city. It also sometimes involves a Sol Offensive where a whole bunch of troops are blown all to heck, or a temporary ceasefire where diplomatic negotiations between players can be initiated. Phase 2 involves drawing Strategy Cards equal to the number of players and setting them face down next to the board. Players then bid and haggle over each card, not really knowing what they might get. Each card typically grants a player a certain advantage, whether a combat strength or defense bonus, or to gain an extra bit of something like movement or Influence at some point during the game. Bidding is fun, even though you’ll sometimes end up with the equivalent of a worthless brick in your hand after you’ve paid five Influence to get it. Phase 3 is Recruitment, where players spend Influence to buy back troops or leaders that have been blown to bits in previous rounds. Typically, there will be lots of these units to buy back each round. Phase 4 is Maneuvering. 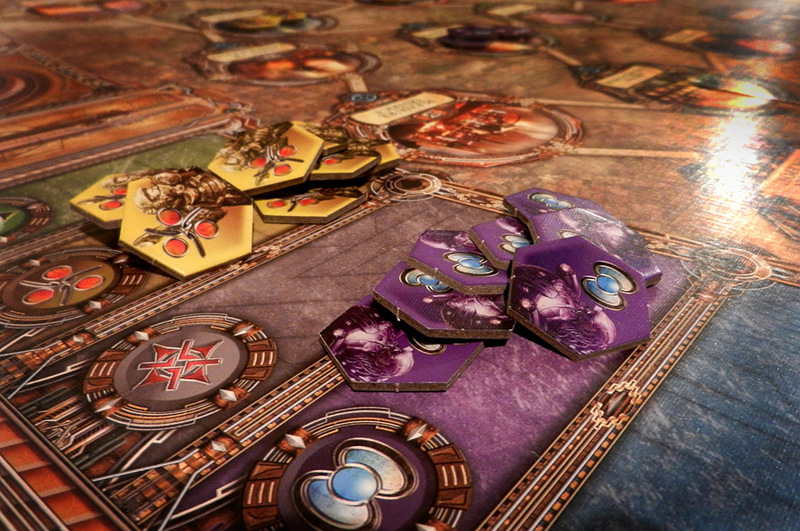 During this phase, players take turns – you guessed it – deploying and moving their troops around the board. However, movement is a bit limited in Rex to keep players from running all over the city. This movement limitation can be modified a bit by holding key parts of the city, namely the Imperial Navy Base or Civilian Spaceport, which gives a player access to transport. Certain races such as the Federation of Sol or Xxcha Kingdom also have movement or deployment modifiers that create a richer flavor during the game. Make no mistake - the battle dial is cool. Phase 5 is the part where players get to blow the crap out of each other. The battle system is pretty cut and dry, but players also get to use the neat battle wheels that come with the game. Basically, the two warring factions each choose one of their leaders (which have a battle modifier) and clip that leader into one of four slots that control what type of Strategy Cards can be used during the battle. Players also select a number of troops in that area that they are willing to sacrifice in the battle. Both players reveal, total battle value is tallied, committed Strategy Cards are used to modify that value, and the player with the highest number is the winner. As I mentioned, it’s simple but fun, and ripe for lots of bluffing and second-guessing an opponent. In Phase 6, players collect Influence from spaces in which they control (and in which there is currently Influence), or from the Influence number on their race sheets. The bombardment token. Oh glorious, beautiful excess. 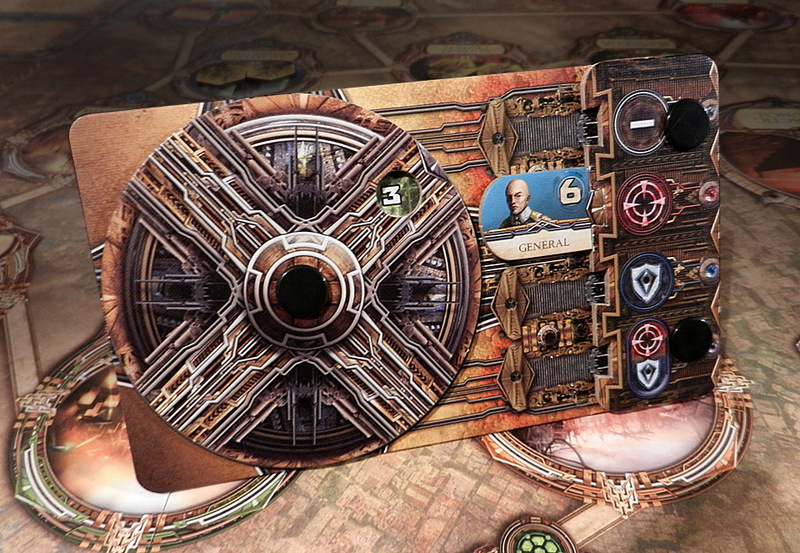 Finally, in Phase 7, a Bombardment Card is drawn which indicates how far the giant Sol bomber fleet moves around the game board. If the Sol fleet passes through any area where there are currently units, then those units are blown all to heck. Basically, there’s a lot of chance for death and dismemberment in Rex. Get used to attrition. The game continues for eight rounds or until a player holds at least three stronghold areas in the city at the end of a game round. Since players may use diplomacy to gain allies, there may be a shared victory. If two allies hold at least four strongholds at the end of a game round, they are declared winners. Alliances of three players may win if they hold five strongholds. The Federation of Sol, the Emirates of Hacan and the Xxcha Kingdom all have special victory conditions which really ramp up the variety and intricacy even more in games with 5 or 6 players. Bodies, piled high as cordwood. At any rate, there may be seven distinct phases in the game, but it’s the subtle treachery that lies in the dark nooks between those phases that really brings Rex to life. Since this is essential for the enjoyability of the game, I’ll return to this point in about a paragraph. But for now it should be noted that there are a lot of racial variables that can add intrigue and excitement to the various phases, and the carnage and story that occurs each round only fuels the fire of the social game at Rex’s center. 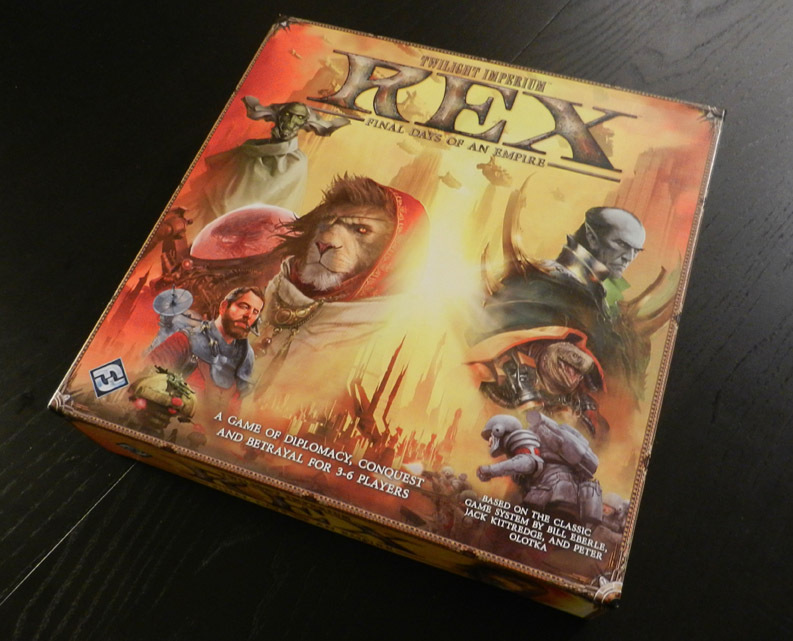 Most modern players may find Rex a bit of an alien experience, as it contains a mix of mechanics and concepts that are not typically integrated. The Dune-like heart at its core is really a relic of an age of gaming where many designers and developers were most likely fans of games like Avalon Hill’s classic Diplomacy. Like Diplomacy, Rex plays a bit like a simplified war game on its surface, but the real meat of the experience lies in the bluffing, negotiating and treaty-making social aspects. 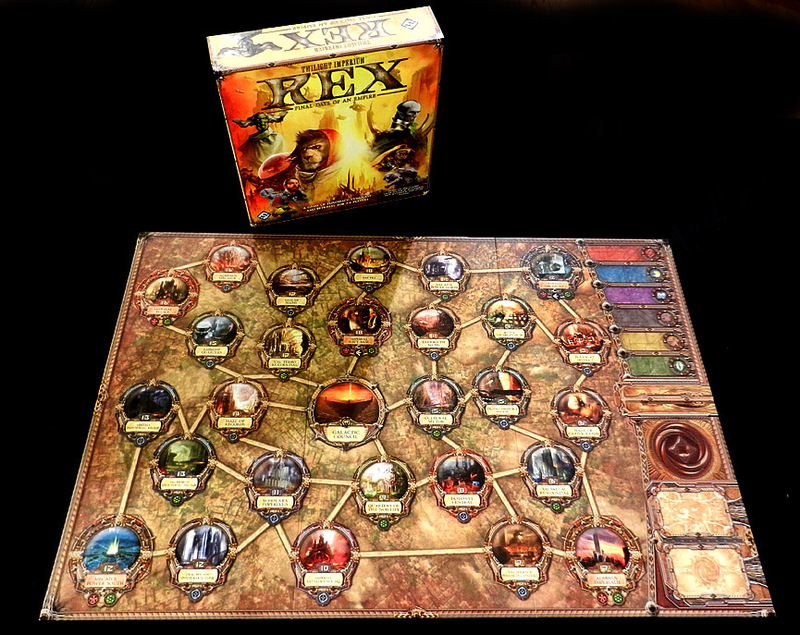 Plus, like Diplomacy and the original Dune’s chaotic cousin, Cosmic Encounter, Rex features the possibility of shared victory, a truly alien concept in a gaming world where many scoff at rulebooks that include fewer than 15 tiebreakers. although I'm bound to raise the ire of more than one Dune geek out there, I find the atmosphere of the game translates superbly to the Twilight Imperium universe and, truth be told, I'd rather explore the dark corners of the Barony of Letnev than House Harkonnen any day. That said, a sandworm or two couldn't hurt. Like many games that feature a hearty mix of social play, Rex is only going to be as fun as the players who play it. 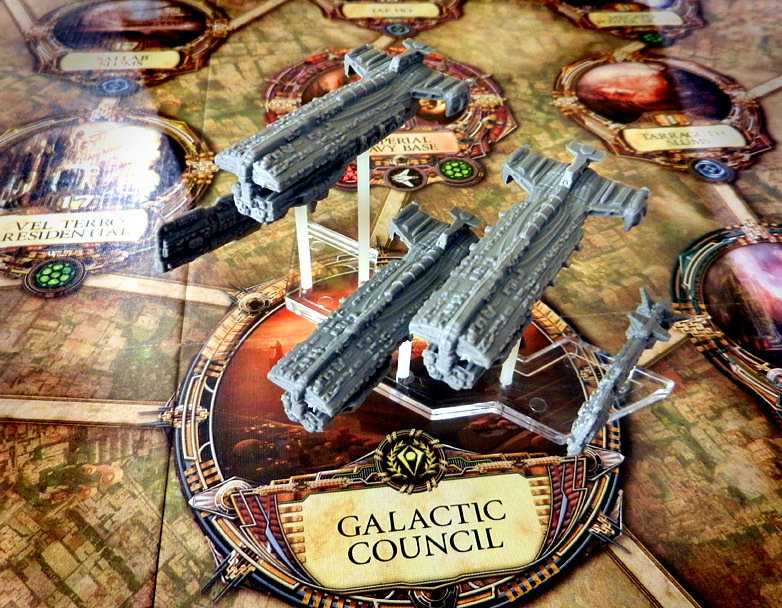 There are many enjoyable aspects of Rex's systems that are fun mechanically - the unpredictable prepping and revealing of the battle dials and Strategy Cards, the blind bidding for the Strategy Cards, and the nail-biting suspense of the giant Sol Fleet marching around the board, threatening to pulverize all in its path. But ultimately, all those systems combined are not enough to save the game if there aren't a group of gamers willing to sweet talk and backstab their way - always lovingly so - to victory. Overall score: 14 out of 18 A solid structure around which beats a strong hybrid heart, but for everyone to enjoy the experience, the game play - like the spice - must flow. 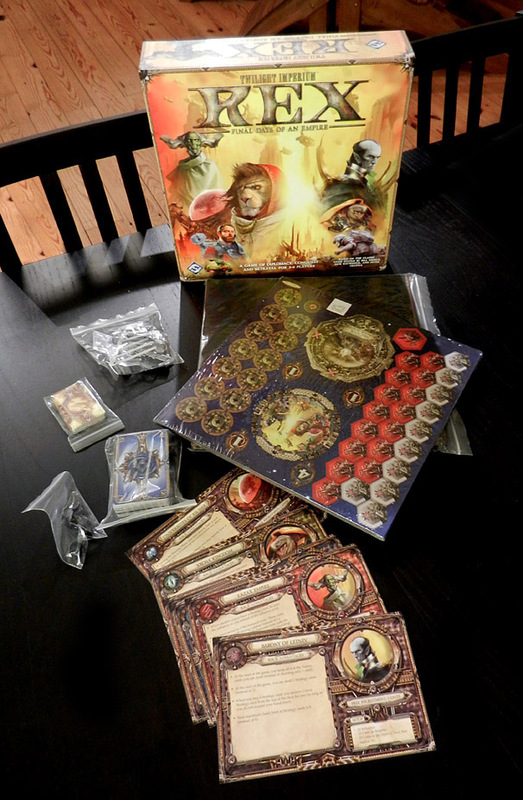 Rex: Final Days of an Empire is a game for 3 to 6 would-be conquerors, developed by Corey Konieczka and John Goodenough for Fantasy Flight Games from an original design by Bill Eberle, Jack Kittredge and Peter Olotka. It retails for $59.95, but you can get it for $39.95 from Boardgameguy.com or ask for it at your favorite local game store. What a surprise, I fall smack dab in the center of Rex’s target audience. I wouldn’t mind seeing a comparison between Dune and Rex at some point, though. I almost had the chance to play Dune before REX arrived, but that fell through and the opportunity is now long lost. Couldn’t agree more with the review. Dune loyalists will not be disappointed. I love Twilight Imperium and I’ve been drooling over this. UNfortunetly I don’t play with groups of 5 or more (which are when these games get REALLY good) to warrant the expense.